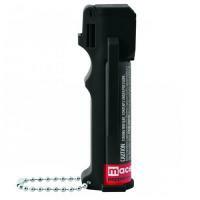 The Mace 10% PepperGard is a compact personal defense spray designed for portability. It features a Velcro attachment for hands-free carry during outdoor activities as well as a belt clip and key chain, making it extremely versatile. It contains a mixture of high-strength capsaicin spray and ultraviolet dye, allowing law enforcement to identify your attacker more easily. The stream spray is highly accurate and reduces the risk of blow-back, and can deliver 10 one-second bursts at a range up to 12 feet. Its finger grip dispenser improves accuracy and retention, and the flip-top safety cap prevents accidental discharge while not in use.